For most people, the holiday season is one of the most joyous times of the year. 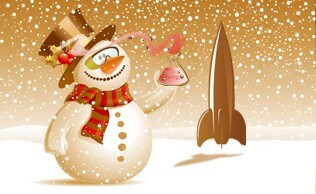 Sipping eggnog, roasting chestnuts, singing carols and stuffing stockings, all add to the delight of the holiday season. And don’t forgot about sledding down snow covered hills, making gingerbread houses, gathering with family by the warm fireplaces, and attending annual holiday parties. Holiday traditions can be fun; especially the holiday parties where you dress up in horrid looking reindeer sweaters, take pictures with loved ones, and sing along with familiar holiday tunes. But perhaps it’s time to switch it up a bit and mix a little science with holiday tradition. Science during the holiday season? It sounds weird but in all actuality, science is embedded in even the smallest of holiday traditions. 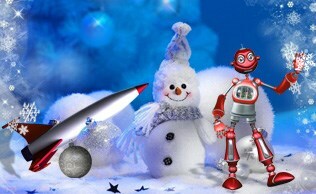 From fireworks and holiday lights, to snowmen and cold winter weather, science is a vital part of the holiday season. The Mad Science holiday party package features several activities and experiments that will get everyone in the holiday spirit! From melting a snowman to witnessing an indoor fireworks display, this holiday party package will amaze and captivate audiences of all ages. See below for more information and details regarding the individual holiday party experiments. Here at Mad Science St. Louis, we can accommodate the various needs of any holiday tradition. Don’t forget to book your magical holiday party by clicking here! The Gift of Magic - Watch as a gift disappears in this dove pan magic trick. Santa Eggbert - Santa Eggbert ate too many cookies and can't get back into his home. We will use to get him inside to the warm fire. The Snow Storm - There has been a huge snow storm and styrofoam snow balls are everywhere! We need to get rid of them so Santa can get out and deliver all the gifts. We will need to use science to clean up this mess. De-Frost the Snowman - A little chemical magic and Frosty is no more. The Season of Lights - The children will wear special spectrum glasses that show every color in the rainbow. New Years Celebration - How to do they get all those different colors in the fireworks? An Alcohol burner will be used to show how different metals burn. Colder than Ice - Brrr. 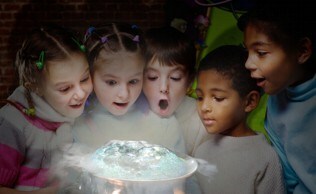 We will top off the party with some exciting dry ice experiments.